CISOs work closely with human resources to investigate potential Web or email policy violations by employees, develop security policies and procedures, and plan for disaster recovery. CFOs live in a world where risk management is the lingua franca. CISOs have to join the conversation. 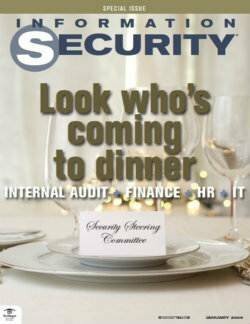 Security steering committees bring HR, finance, legal, IT and audit to the same table, helping facilitate the integration of information security into lines of business. Web application security has moved from a niceto- have to a must-have requirement, for data protection and compliance. Cenzic's Hailstorm, which we last reviewed in 2005, reflects the growth in the depth and maturity of Web application vulnerability assessment software. The GoldKey Secure USB Token works with Windows and Macintosh operating systems to provide a secure place to stash encryption keys for virtual disks. By keeping encryption keys on a small, removable USB token, GoldKey simplifies the task of locking away important information on laptops and encourages good security behaviors. Eight years after the release of Microsoft SQL 2000, we're still looking for help from bolt-on security product vendors to harden and protect critical production database servers. Sentrigo's Hedgehog Enterprise 2.2 is designed to monitor and protect against known and unknown database threats. Trend Micro Worry-Free Business Security (WFBS) delivers comprehensive client/server protection for small businesses against a variety of Web threats for Microsoft Windows 2000/XP/Vista, Small Business Server 2003/2008 and Exchange Server. Security had the attention of SMB execs; the time for facilitating integration is at hand. Mimecast offers a multifaceted SaaS package as demand for email services grows and the vendor landscape consolidates. Tests suggest antivirus software is somewhat ineffective against today's malware strains. Internal audit and information security may often find themselves at odds, but in the end, their respective goals are the same. Technology executives focus on elevating information security in the enterprise. Risk managers should know in order to commit fraud, or any other improper action, an attacker needs access, knowledge/ability and intent. The Republic First Bank information security officer offers guidance on maintaining a security program in lean economic times. Security steering committees provide a forum for security managers and business leaders to discuss security and privacy issues and explore compliance implications of new projects and technology purchases. There are more than 40 state notification laws, but how have they impacted the security of sensitive data? Our two experts debate the issue.